SIMPLE, COMPOUND, COMPLEX SENTENCES - producing, expanding, arranging sentences. This is a ZIP file of 3 pdf files. Each pdf can be bought separately here. 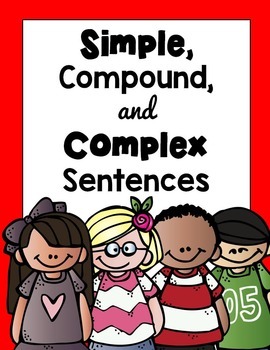 SIMPLE SENTENCES Expanding & Rearranging 18 pgs - Grade 1 & 2, Print N Go! Save over 30% by buying the mega pack here. COMPOUND SENTENCES (Passive Voice included) Grades 1-2, Common Core Aligned. Building complex sentences worksheets: although, because, when, whenever, until, unless, after, if, as, while, though, even though, whereas, since, that, so that. Cut and paste worksheets: unless, since, although, until, because, as, when, whenever, if, because. Putting sentences together, tracing, Spin & Write! & so much more!